Yesterday, SWTOR's servers were down for a considerably long time, and what I didn't know until I checked the notes of that day, was that they were going to merge some of the previously known "destination servers", among which my own server, Nightmare Lands. This time it wasn't a 'voluntary' transfer, as was the case when they merged my old server Frostclaw with Nightmare Lands: now you just end up at a destination server with all your characters. Some people believe this is a bad thing, fearing confusion of identity. I myself think this will rarely be a problem. If you think about it, names in real life aren't unique either. I'm particularly happy myself that I got rid of Gryffin and am now called Griffon again! Back when SWTOR was launched, many players I knew from LotRO went to either Frostclaw or Red Eclipse. Although most of them have stopped playing, who knows who I'll find back on Red Eclipse! My only victim of the merges was Yu'no, who's name was already taken on Red Eclipse. The poor thing will have to live on with a further encoded name as Y-u'no (a cookie if you get the reference). As my guild was doing a late night Ops that we weren't able to attend due to early work/study the day after, we logged Imperial ('imp') side and created new characters. Tiger made a punk-like bounty hunter, I a chiss Imperial agent called Yuniper. I love her cute Leia-like knots, her nice-looking face - she is going to be the new Mata Hari! I might be wrong, though: when I asked the closest authority (Tiger) if Yuniper was indeed pretty, he answered that the red eyes turn him off. 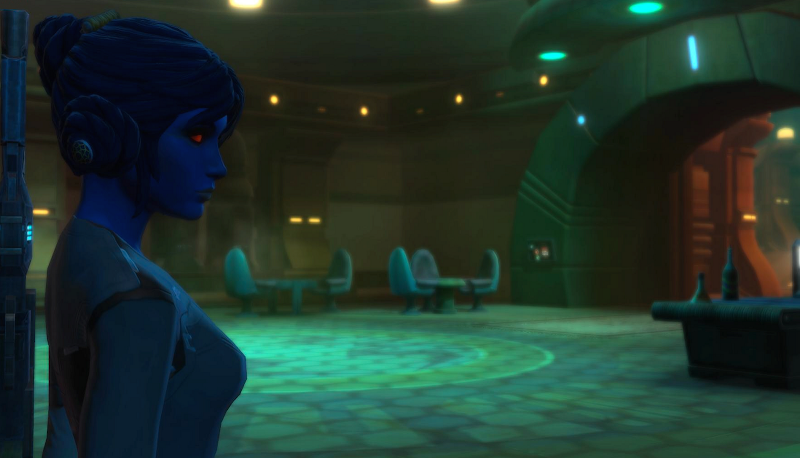 Being a chiss she'll have to live with that handicap, however, it was nice to explore the new (Imperial) world and storylines, and we logged out having achieved level 3. Good to hear there's some hope for Yuniper's career! 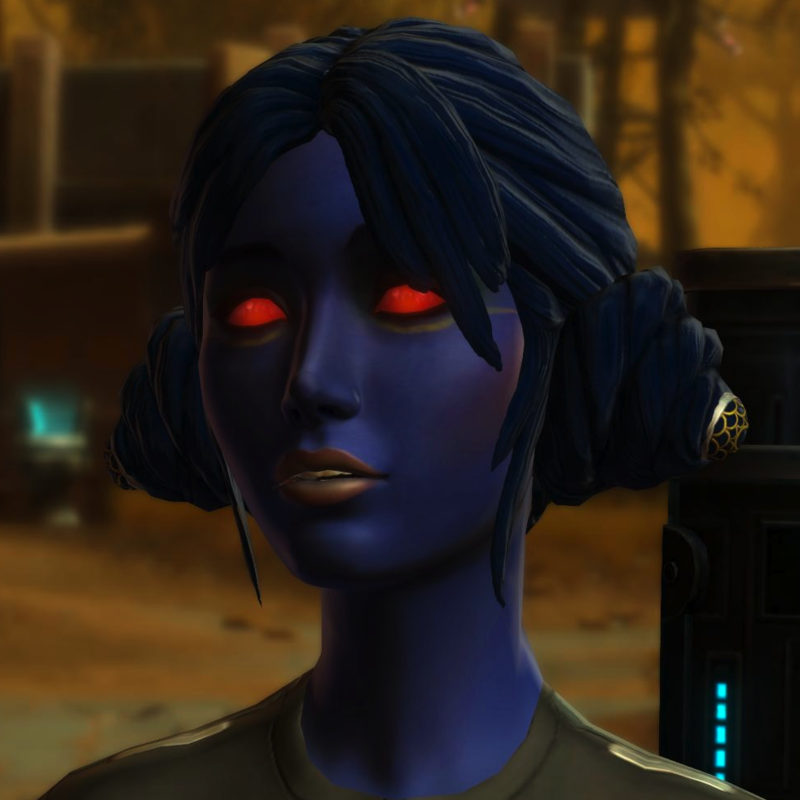 Ohhhh, we gets more character slots... nom nom nom... that means I can have another Sith Sorcie and spec her for healing, wahoo! :D If you ever feel like leveing together a bit on Red Eclipse, let me know. SL actually doesn't have different server regions, the whole planet is on one big grid. I actually didn't realize that was unusual till we took out "Field trip to WoW"